I was trying to figure out what poem to pick while I was going thru my pile of books to be read. 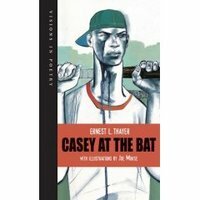 And, happiness, in a pile of books sent by Raab Associates I found Casey at the Bat, illustrated by Joe Morse. CATB is part of the "Visions in Poetry" series from Kids Can Press; it matches classic poems with contemporary illustrations. The result? A poem written in 1888 becomes urban and modern, set in a city with cars, chain link fences and apartment buildings. Instead of being remote, with either an idealized or a historical setting, it is real; it's a poem that is now boy friendly. Because Casey has been illustrated so many times, I can also see this being used to show how illustrations change and affect the text. Pictures matter; pictures can change or alter meaning. What better way to show that than with multiple versions of the same text? Michele starts the party early (Poetry Thursday!) with one of my faves, Gerard Manley Hopkins. Here in the Bonny Glen brings us some Dylan Thomas (and a solution to what to do with an author whose works are still in copyright). Chris Barton reviews a book that tours America using art and poetry. Chicken Spaghetti (also mindful of copyright) with Julia Donaldson (v. v. funny). Jen Robinson honors her childhood with a classic. Bookshelves of Doom lets us know that banning also involves poetry. I'll update this afternoon with more links. and Mungo's Mathoms brings my favorite, Yeats. Oh! And Blog from the Windowsill shares one of the "should be banned" poems. What a great contribution, Liz! Thank you for the link, Liz! Once we've mastered soccer (honey, everyone else is at the other end of the field. near the ball. ), we'll try out baseball. 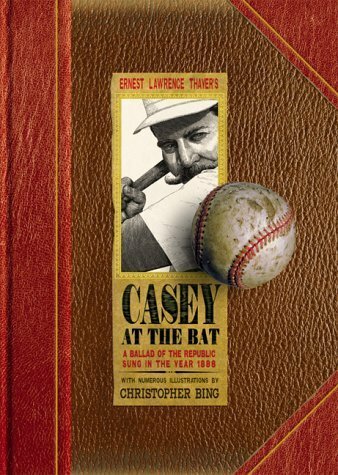 But baseball books--we can do that now. Thanks. There are several great recordings of this now too, including the "Poetry Speaks to Children" anthology. Nice choice for the Boys (and Girls) of Summer.